Are you good at keeping secrets? Do you like a discovering new foodie blogs? Are you up for a challenge? Then, you should head on over to Amanda’s Cooking and join her Secret Recipe Club. That’s exactly what I did just this past month. Here’s how it works. You sign up, and Amanda assigns you a blog. And she assigns your blog to someone, too. And everybody peruses their secret blog and picks a recipe or two and makes them – with your own spin if you want – and then posts about the experience. This month, I got Fake Ginger, a lovely blog put together by another Amanda. Apparently, her blog is named for her unnatural hair color and her dislike of fresh ginger. Egads! She doesn’t like fresh ginger? What will I do? Never fear, she likes a lot of other things that I dearly love, like coconut and peanut butter and chocolate. But wait a minute. I’m supposed to be eating raw right now, right? Good thing adapting is totally within the rules, eh? So, I started checking our the recipe archives with an eye for adapting something to be raw, and I came across Peanut Butter Crusted Sweet Potatoes. Oh my word. Heavenly. Of course, I’m not eating peanut butter. Or baking. Check out all the rest of the Secret Recipe Club participants, too! Oooh, they look like they turned out delicious! 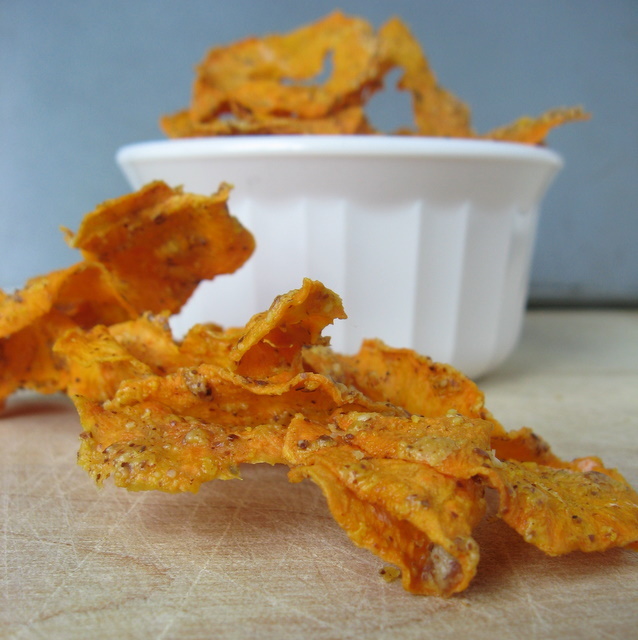 I’m dying for a dehydrator and as soon as I finally get my hands on one, I’m trying your version! Too funny that this recipe has been so uber-adapted throughout the blogosphere by some of my favorite bloggers. I’ll have to try your version, too! These look delicious! Looks like you made some great adaptions! Thanks, it was fun to adapt a recipe to raw. Oh wow, these look and sound AMAZING! Now I need a dehydrator as these look amazing. Thanks Lisa. Your guac looks pretty darn tasty, too. Wish I had a dehydrator. These look great! Glad to be part of SRC with you! You chose such a great recipe from Fake Ginger – I must try these. So fun to be in the Secret Recipe Club with you. This looks absolutely amazing!!!! I must try it!!! Almond butter and sweet potato chips!